BlackwaterBLUE from monkster.com: Marco Van Basten new favourite for Chelsea job? 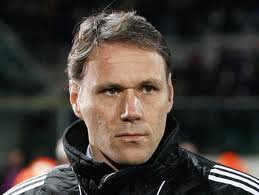 Marco Van Basten new favourite for Chelsea job? Marco Van Basten, Andre Villa Boas and Guus Hiddink are early favourites to take the now vacant Chelsea role. Carlo Ancelotti was sacked yesterday following the end of hard trophy less season at Stamford Bridge and immediately the bookies installed Marco van Basten as the early favourite, the former AC Milan striker is currently out of work after a stint as manager of Ajax and unlike the other two candidates has yet to win a major title as manager. Villa Boas, the 33 year old Porto boss, is 5/1 to land job after a magnificent season that saw him win the Portuguese title and the Europa League and has been likened to former Chelsea manager Jose Mourinho in some quarters. 4/1 shot Hiddink meanwhile is well known to Chelsea fans having had a stint as short spell in 2009 as manager of the club following the sacking Luiz Felipe Scolari, winning the FA cup and only losing one game during his spell. The Dutchman is currently in charge of the Turkish national team although it has been reported that Chelsea owner Roman Abramovich still uses Hiddink in an advisory role*.